Red Bull Racing’s drivers were quickest and fourth-quickest in Friday practice, with Daniil Kvyat leading the way ahead of two Mercedes cars and teammate Daniel Ricciardo. Both Friday practice sessions were washed out, however, making what little running teams were able to complete of minimum value beyond testing essential systems. Daniil Kvyat, who edged Nico Rosberg’s Mercedes by 0.023 seconds, admitted that his Friday honours were largely pointless. Red Bull Racing comes into the weekend with an upswing of momentum after both cars performing strongly in Singapore, where Ricciardo finished second and Kvyat sixth. 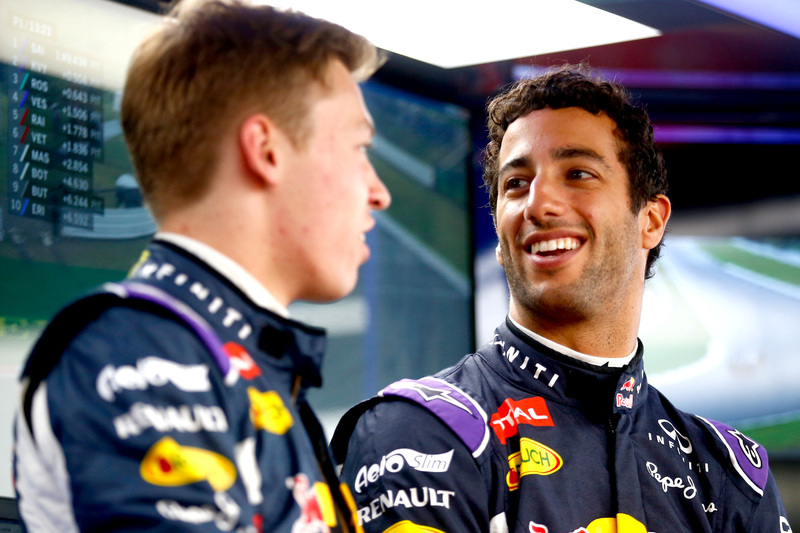 Ricciardo, who has rebounded strongly after a difficult first half to the year in an uncompetitive RB11, said the fast, sweeping corners, dominated in recent years by more impressive Red Bull machines, could again offer the team a competitive haven. Red Bull’s pace on Friday was embellished by the rain, which favoured the car’s high-downforce nature over its weak Renault power unit — but even in the dry Ricciardo thinks he and Kvyat will be thereabouts. “I think we can make up good ground in the corners,” he explained. “Looking at Williams, what we should be able to make up in the corners, they’ll gain back on the straights, so I expect us to be fighting with Williams. The beginning of Red Bull’s season looked unlike any of the five super-competitive years before it, with the team struggling to adapt to new aerodynamics regulations while being weighed down by the 2015 Renault power unit. An upgrade at the British Grand Prix addressing airflow from the front of the car restored the RB11’s balance to something more befitting of the four-times world championship outfit, and since then its performances have improved significantly. At the Belgian Grand Prix, where the Spa-Francorchamps circuit is similar in profile to the Suzuka Circuit, Daniil Kvyat finished fourth behind the two Mercedes cars and Romain Grosjean, while Ricciardo retired from a potential podium-winning position. “For me it feels more together,” said the Australian, describing the difference. “At the beginning of the year there were always signs that the car could be good, but it was just always a bit too inconsistent. “Some corners you’d think it’s hooked up, then a lap later or a corner on the other side of the track it would do something uncharacteristic. “It felt like there were a few holes in its game, but we’ve patched up those holes — [now] like last year, it’s more predictable and more stable under braking. On Saturday all teams start essentially from zero on a completely green track and without much in the way of set-up guidance — and Red Bull Racing will fancy its chances of causing an upset by getting in amongst the frontrunners.